According to Sthalapurana, the world became a dark and a dangerous place when rakshasa disturbed and prevented Brahma from conducting yagna. The Lord appeared and brought light and life back to mankind and hence called Deepaprakasar (Vilakkoli Perumal). Swami Nigamanta Desika's avathara sthala. 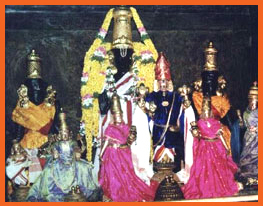 The Moolavar is Deepaprakasar, Villakoli Perumal, Divyaprakasar seen in standing posture facing west. When Brahma was immersed in deep penance, the asuras submerged the whole world in darkness. Lord Vishnu appeared as a bright light to drive away the darkness and hence the name Deepaprakasrar (deepam - light). The Moolavar of this sthalam is Deepa Prakasar. He is also called as "Vilakkoli Perumal, Divya Pirakasar". Moolavar in Standing position facing West Direction. This sthalm is situated about 1/2 km from Ashtabhujam temple in Kanchipuram.